Forest Lawn Cemetery – under a beautiful canopy of trees, this massive cemetery adjacent to Delaware Park offer miles of bike riding opportunities. You can enjoy a tranquil ride past jaw-dropping examples of funerary art and architecture, sculpture and the final resting place of some of the United States’ most prominent citizens. 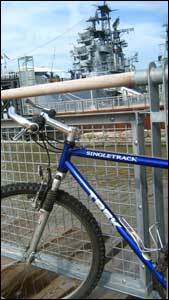 Riverwalk Bike Path – beginning in downtown Buffalo, this path follows the Niagara River northward to the Erie Canal city of North Tonawanda. On this path, you’ll see Buffalo’s waterfront community, the Frank Lloyd Wright Boathouse, the Peace Bridge and much more. Erie Basin Marina & Cobblestone District – In this ride you can get an upclose look at the cobblestone streets around HSBC Arena, Buffalo & Erie County Naval Park, the Erie Basin Marina Gardens, and the Buffalo Lighthouse. Richmond Avenue – a majestic Buffalo Street lined with large Victorian homes that features bike lanes for a safe and unobstructed ride. Delaware Park – Scajaquada Bike Path – enjoy the 1.7 mile ring road around Delaware Park, before embarking on the Scajaquada Bike Path that will take you past the Buffalo & Erie County Historical Museum and onward to the Niagara River and the Riverwalk Bike Path. ¡Ay Caramba! The fiesta’s in Buffalo! You may not be in Mexico, but if you’re in Buffalo, you definitely will feel like you’re south of the border on May 5th. 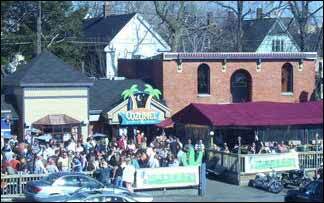 Buffalo’s first official Spring outdoor party holiday, Cinco De Mayo will come full force this Tuesday. Join the thousands that come out in honor to celebrate the Mexican army’s defeat of the French forces more than 140 years ago—or at least use it as the excuse to spend the day bar hopping and eating Mexican food. The most popular spot to celebrate this holiday is Cozumel Grill and Tequila Bar. Sport your sombrero and head down for an afternoon (the party starts at 2pm) and night of tacos, tequila and tropical fun. Cozumel extends its outdoor patio into the parking lot and every year, numerous television and radio stations broadcast live from this day’s biggest party. Want in on the fiesta but want to avoid the crowds? This may be impossible today, but try Salsarita’s, a fast-food Mexican eatery with full service bar in Buffalo’s Chippewa Entertainment District or Gramma Mora’s on Hertel Avenue, a homestyle Mexican restaurant. If you want to brush up on your Spanish skills ahead of time or impress your friends with your salsa moves, visit El Bueno Amigo or the Latin American Institute (across the street from one another) on Elmwood Avenue in Allentown. Both locations offer Spanish language and dance classes and sell a variety of Latin American handicrafts, musical instruments, jewelry and clothing. One of the most eclectic neighborhoods in Buffalo is the Allentown Historic Preservation District. Home to some of Buffalo’s best architecture, shopping, and nightlife, Allentown is also home to one of the nation’s largest outdoor art festivals. One of the biggest attracting points of visitors to this Bohemian neighborhood though is its offbeat restaurants that you can’t find in other cities. Allentown offers a variety of creative dining options that are unique to this neck of the woods. Start off by stopping by Betty’s, Buffalo’s best kept secret. Located in a beautifully restored century old house in the middle of a residential neighborhood, Betty’s boasts homemade breakfasts, lunches and dinners with a variety of vegetarian and local foods. This secret is quickly catching on as Sunday brunches oftentimes finds people lining up around the corner for spinach potato pancakes or the scrambled tofu hash. Try the Falafel Bar for lunch. This newest location of the popular Buffalo Mediterranean eatery features authentic falafel, hummus and other popular Middle Eastern foods. The tabouli is not to be missed here! Grab a fresh fruit smoothie or fruit juice made to order before antiquing or checking out one of the dozens of art galleries around the neighborhood. Catch dinner at Sample Restaurant—where you can literally sample a variety of gourmet cuisines. Try the carrot ginger soup, served in a shot glass or the steak frite—seared sirloin steak and Worcestershire aioli served atop a house made french fry! If you’re still hungry, don’t worry, Sample also serves a variety of small plates and desserts to compliment. Allentown offers more than two dozen restaurants within a one mile radius—all independently owned. For a complete listing and description of the dining options available, visit our website. 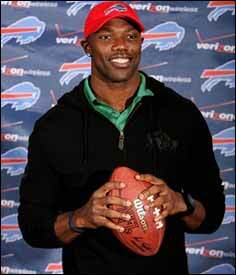 Last week the Buffalo Bills revealed their schedule for the 2009 NFL season. With the addition of Terrell Owens to the team and a Monday Night season opener against New England (commemorating the 50th anniversary of the founding American Football League), this season has the potential to really wow Bills fans. TICKETS: Bills game tickets are some of the lowest in the league with an average per game price of $51.24. PARKING: For alternative parking options, try the ECC (Erie Community College) lots across the street on Abbott Rd. Prices are always cheaper than the main lot. HOTEL: The stadium is located in Orchard Park (a suburb 15 min. south of the city). Here’s a list of the closest hotels, although no hotel is truly that far. WEATHER: If you’re sitting behind the Bills bench and the sun is shining, don’t forget your hat and sunglasses! The sun lingers for a majority of the game so be prepared. A Bills game in the snow is truly an experience and something Bills fans look forward to, if the mercury is dropping, layer up! TAILGATING: No matter what time kickoff is or what the weather is outside, Bills fans love to tailgate so join the party! Food finds range from deep friend turkeys to chicken wings to the most elaborate of feasts. Take a tour of the parking lots to witness the fun! GROUPS: Coming with your entourage? Group discounts are offered for parties of 15 or more. 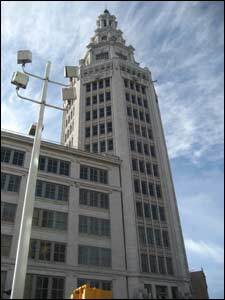 One of the most unique looking buildings on downtown Buffalo’s skyline is The Electric Tower, located at 535 Washington Street. The pearly white terra cotta building with a 14-story octagon tower makes an indelible impression on the city’s visitors, as well as residents. The building is also significant to Buffalonians as it is the site of Buffalo’s annual downtown New Years Eve balldrop, which is one of the largest celebrations in the country. Depending on the time of year, the tower is bathed in colorful lights, often reflecting an upcoming holiday or to salute a community event or organization. So much of the building’s identity is centered on its unique exterior, but what’s inside? The Electric Tower is still very much a working Class A office space in downtown, so you just can’t walk in and start wandering the halls. However, it offers a very little known architectural experience. If you walk into the stunning marble lobby – which was uncovered during recent renovation – you will be completely blown away by the ornamental beauty of an architectural gem. From the floor to the ceiling, your eye will constantly be drawn to the finite detail and opulence from a bygone era. Walk straight through the lobby and you’ll discover a hallway filled with large photographs and historical documentation detailing The Electric Tower’s history. It’s a brief, but fulfilling architectural experience, that is footsteps away from the Hyatt Regency, Comfort Inn & Suites downtown, Chippewa Street, and the Buffalo Theatre District. The Electric Tower is also one of the feature stops on the “Walk Buffalo” tour – a self-guided walking tour of historic downtown Buffalo. The 90 minute walking tour visits over 28 sites in downtown Buffalo. So if you’re in downtown Buffalo take a peak inside The Electric Tower for a brief encounter with Buffalo’s wonderful architecture. Despite the fact that the museum occupied cramped quarters for the first forty years of its existence, the Burchfield Penney Art Center is legendary for its exhibition openings – arty parties packed with lovers of good food, fine wine and painting, photography and multimedia installations. This past Friday was no exception and, in fact, featured an even larger crowd than those of the recent past since the BPAC has now moved into a new 84,000 square foot home. 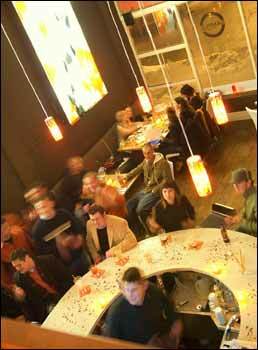 Designed by New York’s Gwathmey Siegel Associates, this new space was designed to not only show off the best of Buffalo’s vibrant visual arts scene, but to accommodate throngs of art loving patrons intent on having a good time. Much of the second floor of the museum was designed with large gatherings in mind and even features a huge balcony overlooking Elmwood Avenue and the Albright-Knox Art Gallery. This space is warm, inviting and has a great view — so it’s no surprise that art lovers are attracted to it and the programming going on within. The occasion for Friday’s opening was an exhibit of Burchfield’s sketches and paintings entitled “Charles Burchfield: The Romance of Urban Decay.” Like his contemporary Edward Hopper, Burchfield, at least in the early part of his career, was a poet of ordinary, everyday American reality. 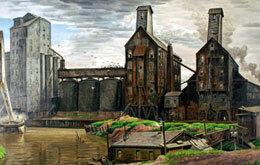 His subject matter in this instance includes grain elevators along the Buffalo River, wood frame houses in the Allentown district, the once lively commercial strip along Genesee Street and an enchanting portrait of the Electric Tower, the former home of Niagara Mohawk. While much of Buffalo’s urban fabric has been altered, much remains and it’s fascinating to make a mental inventory of the passage of time in these very familiar landscapes. Visitors to the exhibit will also find much to hold their attention in the notes Burchfield made as he sketched in the field. He was a dedicated diarist and talented writer and the exhibit allows you to look over his shoulder, a witness to the creative process of an artist of the highest caliber. Friday night’s opening also featured a concert by Ronny Whyte and Boots Malestrom in the Burchfield’s new auditorium. This gorgeous and acoustically pristine space was filled to capacity and seems to have very quickly found a place as a must-see performance venue in a city filled with them.